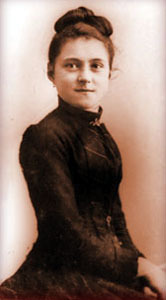 Thérèse de Lisieux (2 January 1873 – 30 September 1897), or Sainte Thérèse de l'Enfant-Jésus et de la Sainte Face, born Marie-Françoise-Thérèse Martin, was a Roman Catholic Carmelite nun who was canonized a saint and is recognized as a Doctor of the Church, one of only three women to receive that honor. She is also known as The Little Flower of Jesus. St. Thérèse of the Child Jesus was born in Alençon, France, the daughter of Blessed Louis Martin, a watchmaker, and Blessed Marie-Azélie Guérin, a lacemaker. Both her parents were very religious. Louis had attempted to become a monk, but was refused because he knew no Latin. Azélie was rejected as a nun because she was considered to have no vocation; instead, she asked God to give her many children and let them all be consecrated to God. Louis and Zélie met in 1858 and married only three months later. [] They had nine children, of whom only five daughters—Marie, Pauline, Léonie, Céline and Thérèse—survived to adulthood. Thérèse was their youngest child. Azélie's lace business was so successful that Louis sold his watchmaking shop to his nephew and handled the traveling end of her lacemaking business. Zélie died of breast cancer in 1877, when Thérèse was only four years old, and her father sold the business and moved to Lisieux, in the Calvados Department in Normandy, where Azélie's brother Isidore Guérin, a pharmacist, lived with his wife and two daughters. Thérèse studied at the Benedictine Abbey of Notre Dame du Pré. When she was nine years old, her sister Pauline, who had acted as a "second mother" to her, entered the Carmelite monastery at Lisieux. Thérèse also wanted to enter Carmel, but was told she was too young. At 14, after her sister Marie entered the same Carmelite monastery, Thérèse renewed her attempts to join the order, but the priest-superior of the monastery would not allow this on account of her youth. Later, her father took Thérèse on a pilgrimage to Rome, and during a general audience with Pope Leo XIII, she asked him to allow her to enter at 15, but the Pope said: "Well, my child, do what the superiors decide." Shortly thereafter, the bishop of Bayeux authorized the prioress to receive Thérèse, and in April 1888 she became a Carmelite postulant. In 1889 her father suffered a stroke and was taken to a private sanatorium, the Bon Sauveur at Caen, where he remained for three years before returning to Lisieux in 1892. He died in 1894. Upon his death, Céline, who had been caring for their father, entered the same Carmel as her three sisters, on 14 September 1894; their cousin, Marie Guérin, entered in 1895. Léonie, after several failed attempts, became Sister Françoise-Thérèse, a nun in the Order of the Visitation of Holy Mary at Caen. Photograph of Saint Thérèse of Lisieux in the Carmelite Brown Scapular, 1895. Passages like this have left Thérèse open to the charge that hers is an overly sentimental and even childish spirituality. Her proponents counter that she sought to develop an approach to the spiritual life that was understandable and imitable by all who chose to do so, regardless of their level of sophistication or education. Funerary monument in the Church of Saint Francis, in Évora (Portugal). Thérèse's final years were marked by a steady decline that she bore resolutely and without complaint. On the morning of Good Friday, 1896, she began bleeding at the mouth due to a pulmonary hemoptysis; her tuberculosis had taken a turn for the worse. Thérèse corresponded with a Carmelite mission in what was then French Indochina, and was invited to join them, but because of her sickness, she could not travel. In July 1897 she was moved to the monastery infirmary, where she died on September 30, 1897, at age 24. On her death-bed, she is reported to have said, "I have reached the point of not being able to suffer any more, because all suffering is sweet to me." Since 1973, two centenary editions of Thérèse's original, unedited manuscripts, including "Story of a Soul," her letters, poems, prayers, and the plays she wrote for the monastery recreations have been published in French. The authoritative English translation of the centenary edition of Therese's writings is available from ICS Publications in Washington, D.C. "Story of a Soul," "Last Conversations," and the two volumes of her letters were translated by John Clarke, O.C.D. ; "The Poetry of Saint Therese" by Donald Kinney, O.C.D., and "The Prayers of St. Therese" by Alethea Kane, O.C.D. Pope Pius X signed the decree for the opening of her process of canonization on June 10, 1914. Pope Benedict XV, in order to hasten the process, dispensed with the usual fifty-year delay required between death and beatification. On August 14, 1921, he promulgated the decree on the heroic virtues of Thérèse and gave an address on Thérèse's way of confidence and love, recommending it to the whole Church. Thérèse was beatified in April 1923 and canonized on May 17, 1925, by Pope Pius XI, only 28 years after her death. Her feast day was added to the Roman Catholic calendar of saints in 1927 for celebration on October 3. In 1969, 42 years later, Pope Paul VI moved it to 1 October, the day after her dies natalis (birthday to heaven). The Basilique Sainte-Thérèse in her home town of Lisieux was consecrated on 11 July 1954, and has become a centre for pilgrims from all over the world. Thérèse of Lisieux is the patron saint of people with AIDS, aviators, florists, illness, and missions. She is also considered by Catholics to be the patron saint of Russia, although the Russian Orthodox Church officially recognizes neither her canonization nor her patronage. In 1927 Pope Pius XI named Thérèse a patron of the missions and in 1944 Pope Pius XII named her co-patroness of France alongside St. Joan of Arc. By the Apostolic Letter Divini Amoris Scientia ("The Science of Divine Love") of October 19, 1997, Pope John Paul II declared her one of the thirty-three Doctors of the Universal Church, one of only three women so named [the others being Teresa of Avila (Saint Teresa of Jesus) and Catherine of Siena. Thérèse was the only saint to be given recognition as a Doctor of the Church during Pope John Paul II's pontificate. A movement is now under way to canonize her parents, who were declared "Venerable" in 1994 by Pope John Paul II. In 2004 the Archbishop of Milan accepted the unexpected cure of a child with a lung disorder as attributable to their intercession. Announced by Cardinal Saraiva Martins on July 12, 2008, at the ceremonies marking the 150th anniversary of the marriage of the Venerable Zelie and Louis Martin, their beatification[] (the last step before canonization) took place on Misson Sunday, October 19, 2008, at Lisieux. Some interest has also been shown towards promoting for sainthood Thérèse's sister, Léonie, the only one of the five sisters who did not become a Carmelite nun. Léonie Martin, in religion Sister Françoise-Thérèse, died in 1941 in Caen, where her tomb in the crypt of the Visitation Monastery can be visited by the public. Together with St. Francis of Assisi, St. Thérèse of Lisieux is one of the most popular Catholic saints since Apostolic times. As a Doctor of the Church, she is the subject of much theological comment and study and, as an appealing young girl whose message has touched the life of millions, she remains the focus of much popular devotion. Her autobiography has inspired many people, including the Italian writer Maria Valtorta. For many years Thérèse's relics have toured the world, and thousands of pilgrims have thronged to pray in their presence. In 1925 the Carmelite Sisters of the Most Sacred Heart of Los Angeles founded St. Theresa School in Coral Gables, Florida. In 1925, the National Shrine of the Little Flower in Royal Oak, Michigan, was built in honor of Thérèse of Lisieux. In 1929 the Basilica of the National Shrine of the Little Flower, located in San Antonio, Texas, was established. In 1939, Cardinal Dougherty built a high school in Philadelphia, Pennsylvania in honor of St. Thérèse: Little Flower Catholic High School for Girls. The municipality of Sainte-Thérèse-de-la-Gatineau, Quebec, is named in her honour. There is a St. Theresa of Lisieux Catholic High School in Richmond Hill, ON. The Society of the Little Flower and Shrine to St Therese in Niagara Falls, ON. ^ "Béatification à Lisieux des parents de sainte Thérèse" (in French). L'essemtiel des saints et des prénoms. Prenommer. 2008-10-19. http://www.prenommer.com/a-la-une-paris/beatification-a-lisieux-des-parents-de-sainte-therese/. Retrieved on 2008-10-22. ^ "God's Word renews Christian life". l'Osservatore Romano (Holy See). 2008-10-22. http://www.vatican.va/news_services/or/or_eng/043w01.pdf. Retrieved on 2008-10-22. ^ "Sainte-Thérèse-de-la-Gatineau (Municipalité)" (in French). Commission de toponymie du Québec. http://www.toponymie.gouv.qc.ca/ct/topos/carto.asp?Speci=56439&Latitude=46,3&Longitude=-75,86667&Zoom=1700. Retrieved on 2008-09-16.